A win for all: From left, Sarah-Jayne Curry, of the RFDS; Lucy Martin, of Archer Brewing; Gavin Scurr, of Piñata Farms; Gavin Croft, of Archer Brewing; Stuart Martin, of Archer Brewing. Looking for downloadable images or logos? What began as a Brisbane brewery's intention to help Piñata Farms during the strawberry contamination crisis in September 2018 resulted in a win for Piñata's preferred charity, the Royal Flying Doctor Service. Independent brewery Archer Brewing, which produces fruit beer from Australian ingredients, including Piñata strawberries, raised $1,500 during the crisis after brewing a strawberry ale and hosting two community events. "We drove up to the farm ourselves, picked up a ute full of strawberries, and brewed a strawberry ale," owner Lucy Martin said. "Once the beer was ready, we hosted two Karma Keg events with Bloodhound Corner Bar and Kitchen in Fortitude Valley, and Crafted Beer Festival on the Gold Coast, meaning customers could pay whatever they wanted for a glass of strawberry ale with all proceeds going back to Piñata Farms. 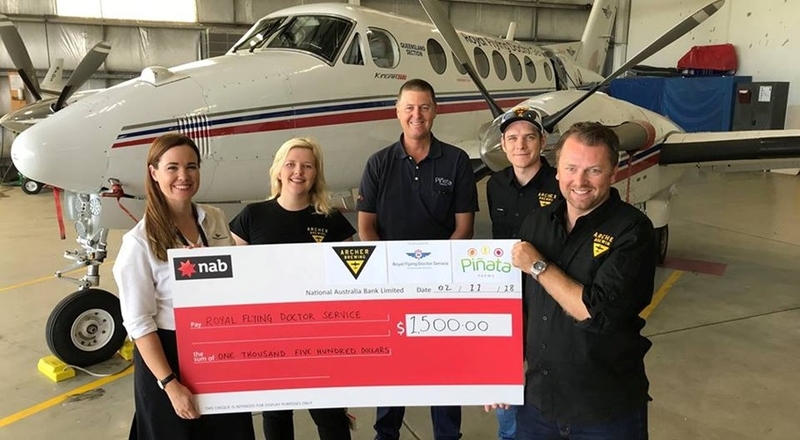 "Piñata Farms was so overwhelmed by the generosity, so instead wanted to donate the funds to the Royal Flying Doctor Service. "One of Archer's owners, Stuart, used to be a commercial pilot, and dreamed of flying for the RFDS himself, so we were ecstatic to help a cause so close to our hearts." Piñata Farms' managing director Gavin Scurr said Archer Brewing's support and that from the Australian public during and following the crisis had uplifted and motivated growers. The cheque was donated to the RFDS at Brisbane Airport on November 2.